WordPress does not have a contact form option by default. Although it is very easy to use a plugin in order to make a contact form for your website. There are several different plugins available to do the job. Contact Form 7 is one such plugin that is available to freely download and install. In order to set it up you need to go to the admin section of your WordPress website first. Go to the Plugin section and select ‘Add New’. You can also search for the Contact Form 7 plugin from the search field. 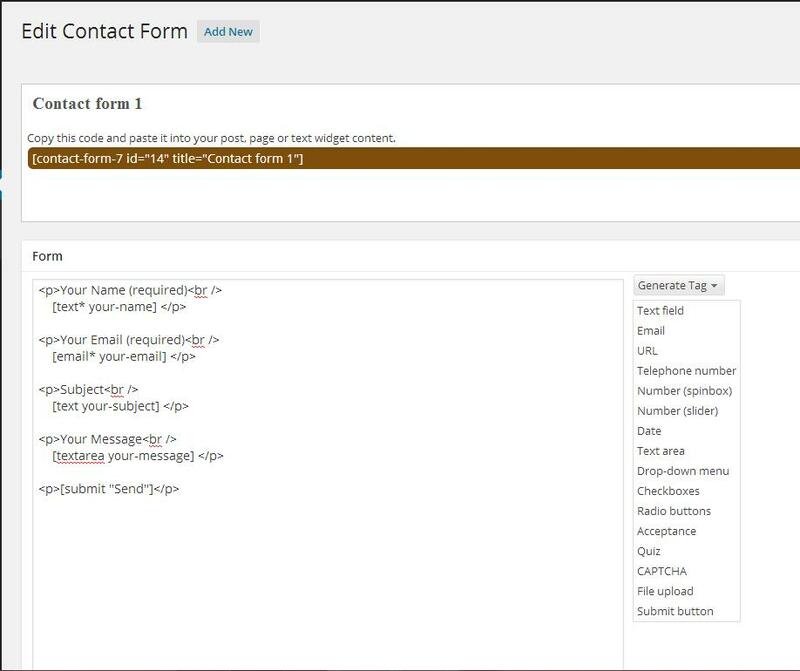 On the other at times the Contact Form 7 plugin is already included in the template that you are using. In that case all you need you need to do is go to the list of plugins and activate it. Creating a new contact form using this plugin is also quite simple. You first need to select the Contact tab on the admin menu to start using the plugin. Once in you can create a new form or select an existing one to modify it. You will find a drop down box on the left side of your screen which says ‘Generate Tag’. You can used this to place the kind of input option you require on the contact form. For example if you simply require the users to input their email address you can select ‘Email’ from the ‘Generate Tag’ drop down which will then allow to set several other options like the class, id, whether it is required field or not and value and name. This will generate a tag for you to place on the form and also on the feedback that you will be receiving. Similarly other fields can also be generated in this manner like text , text area , phone, check boxes, radio boxes fields etc. The next thing that you must do is to enter the subject and email address to where you wish the emails to be sent. Once done you are ready to publish your form, though you first need to save it. Once you do save the form it will generate a short code that you can place on your page or post in order to load the form in the page once the user visits the contact page. Thus creating a form for your website is as simple as that. This is indeed a simple task though some computer knowledge is required in order to carry out the process. Although you do not need any programming knowledge in order to add a contact form to your page or post or even to generate it using the Contact form 7’s very good user interface; some may find it difficult to use if they have very little experience doing something like this. In addition to which user often have the need to place the contact form within their customised pages. This requires the use of a programming language called PHP which is a slightly advanced topic and won’t be covered here. Hence WordPress which is an open source software, free to download and install is very easy to use in general along with the many plugin options that are available. But if you do require customization of any kind and are not very IT savvy it is best to leave it to professional WordPress Web Developers. Alakmalak is one such company which hires WordPress web developer who can solve big and small tasks.